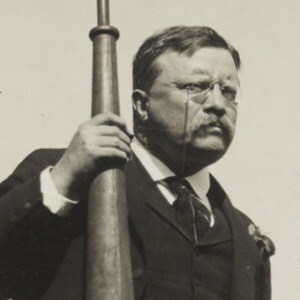 Blind in one eye; wracked by malarial fevers; arthritic, overweight, and still carrying a bullet in his breast from an assassination attempt five years before, Theodore Roosevelt was dying to serve in World War I. He was, he reminded all who could hear, an ex-Commander in Chief of the United States Army, and ready to once again lead “his” First United States Volunteer Cavalry into the fray. But President Wilson, whom Roosevelt detested, refused the appointment – for reasons which Roosevelt excoriates him here. If Mr. Wilson had been able to rise above the cheapest kind of party politics, I would be over myself. My four sons are going…. The recipient of this letter, the promising young Harvard archaeologist Oric Bates, was apparently on his way over to serve in Egypt; he died, however, while training as an officer, in 1918. Also dead in The Great War was Roosevelt’s youngest son, Quentin; his other boys survived, all distinguished for their bravery. Typed Letter Signed, 1 page, quarto, on the letterhead of the Metropolitan magazine, New York City, June 11, 1917. To Oric Bates at Harvard. The first volume has come, and I wish to congratulate you with all my heart. It is a great piece of work to have done. More than that, my dear fellow, I wish to congratulate you on going off to Egypt. It is a fine thing to do, and it is just what you ought to do. If Mr. Wilson had been able to rise above the cheapest kind of party politics, I would be over myself. My four sons are going. By the way, do you ever see young Jack Coolidge, who has apparently been sent away from the Plattsburgh camp on the ground of not being physically fit? It is perfect nonsense to turn away a young fellow of his type. He is exactly the kind of man I would have taken with me, if I had been allowed to raise the division. Peabody Museum of Harvard Univ. "THE LIVEST MAGAZINE IN AMERICA"